The HealthyLine Neck Pillow combines the ancient healing power of minerals with Far-Infrared Therapy (FIR) to enhance blood flow in the neck. 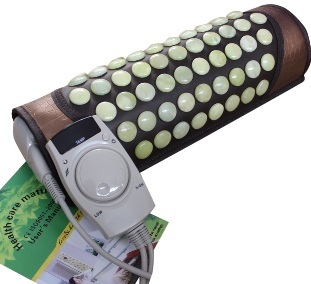 Far-Infrared Therapy also promotes muscular and skeletal health along the spine. Additionally, special care and attention paid to the muscles and connective tissue in the neck can reduce inflammation around the jaw, reducing the severity of such conditions as TMJ. Maintaining proper blood flow through the neck can also increase capacity in the upper respiratory cavity, improve the ability of the body to shed toxins, and may reduce headaches. The health and well-being of the spinal bones in the neck area are of critical importance in our modern world. Because many of us cannot be as active as our ancestors, the tension of daily living can build up in the neck area. This muscular tension reduces blood flow and can cause discomfort and distress from the top of our heads, such as chronic headaches commonly called tension headaches, to the tips of our fingers. Muscular tension in the neck can lead to jaw alignment problems, popping or cracking when moving the jaw, and headaches. Muscular weakness in the neck due to chronic health issues or our sedentary existence can lead to misalignment of the spinal bones and pinched nerves. Any limitation of neural pathways from the neck down the arm into the fingers can greatly impact our sense of touch, the ability to judge hot and cold as well as pressure, and fine motor function in our hands. Additionally, improving the capability of the lymph system by directly reducing the toxin load for the glands in the neck can lighten the toxin load for the entire endocrine system. For people of limited mobility or who suffer chronic pain, this method of increasing blood flow may be the most effective way for them to help their body increase the function of their red blood cells and improve the functioning of their immune systems. The combination of Far-Infrared Therapy and minerals greatly improves the detoxification process because of the high output of negative ions, which aid the body in shedding free radicals and other environmental toxins that burden our immune systems. For instance, jade maintains and transfers heat extremely well, and it is the heating process that helps increase blood flow. The combination of heat and negative ions provides a wonderful opportunity for detoxification. This pillow is available with other minerals, including amethyst, which provides a great boost to the red blood cells working hard to help the body shed toxins and has been known for centuries as a source for mental alertness and clarity.